In the first twenty-five years of its operation, Chevy Chase Lake offered band concerts followed by dancing on almost every night except Sunday. But between 1894 and 1915, there were many other attractions that drew amusement park patrons from around the DC metropolitan area. As described in the exhibit section “Amusements for All,” these included boating, swings, a shooting gallery, a “rustic” outdoor movie theater and a merry-go-round, plus the appearances of tightrope walkers, gymnasts, and divers. These attractions were all introduced by Herbert Claude, the manager of the amusement park. In the next few years, after Claude’s contract and lease of the park ended in 1917, many of these attractions would be eliminated by the next manager, Meyer Davis, who focused on musical entertainment. Davis’ bands began playing at Chevy Chase Lake in 1916, so it’s likely that Mr. Claude was responsible for hiring him. But when Davis became the manager, in 1917 or 18, the other amusements at the park were limited to the café, the bowling alley, and possibly the shooting gallery. It was still an amusement park, but its patrons were mainly younger people who wanted to dance. And they wanted to dance to the newest music, influenced by ragtime’s syncopation, and the rise of jazz in American popular music. This was a distinct departure from the waltz and two-step of Prof. Donch’s Band or the U.S. Marine Band. This new music was matched by new ways of dancing. Both the “dance craze” in the teens and the rise of vaudeville would shape the musical programs at Chevy Chase Lake. p. 62, from Albert W. Newman, Dances of To-Day. Philadelphia: The Penn Publishing Company, 1914. From the Library of Congress exhibit: "An American Ballroom Companion: Dance Instruction Manuals." LOC GV1755 .N5. "Everybody'd Doin' It Now," by Irving Berlin, 1911. Sheetmusic, Library of Congress Performing Arts Encyclopedia. 5/364. By 1911, when Irving Berlin published his song, “Everybody’s Doin It Now,” a great dance craze was sweeping the country. Driven by the syncopated beats of ragtime, this dance movement was particularly popular with young women. Historians of popular culture note that working class girls as well as society girls patronized the same dance halls. Many girls learned the new dances, and as just as it worked with skating, where the girls went to dance, the boys went, too! But these new dances, often called “animal dances” with names like the turkey trot, the bunny hug, or the grizzly bear, provoked deep disapproval from many community leaders. The new dances seemed overly sexualized to them, with gyrations and embraces that challenged social propriety. Strict Methodists were forbidden to dance, whether the traditional two-step or the new dances. 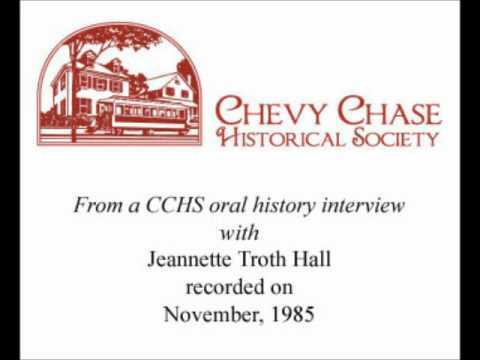 Click the YouTube below to listen to a clip from an interview with Jeannette Troth Hall, as she remembers how she felt about not being allowed to dance at Chevy Chase Lake. "Just a little trot forward, and then a little trot backward, and then a little trot sideways -- that's all -- and then Boston for eight measures, and there you have it -- the dance that every one is talking about." Of course, the fun of dancing closely with your partner, and even “dipping,” was what made these new dances so popular. A dance could lead to flirting, and perhaps even a kiss! A few months later, on January 22, 1912, p. 3, The Washington Post reported that a couple was arrested for doing a “dip” as they danced. On the next page, read about dances that were banned at Chevy Chase Lake.